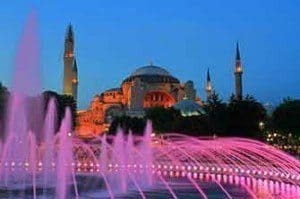 Spectacular 8-Day Turkey and Greece tour from Istanbul! An amazing tour where you meet Istanbul, see some wonderful Greek islands and cruising the Mediterranean in 8 days. The Turkey and Greece tour from Istanbul starts with an included transfer from either of two Istanbul airports, cruise port or your centrally located hotel. Check in and enjoy an optional half day sightseeing tour of this beautiful and historic city. Blue Mosque, Hagia Sophia are just pieces of rich historical heritage of Istanbul that every traveler must place on its own bucket list of things to see in a lifetime. Day one finishes with dinner at your hotel and enjoying the evening at leisure. The adventure begins! After breakfast, travel to Ataturk Airport for your flight to Izmir and country’s stunning turquoise coast. On arrival, travel to Kusadasi and embark on your 4-day Aegean cruise. In the early afternoon, board your ship and check Patmos in the Greek Dodecanese archipelago. With two UNESCO World Heritage sites, Patmos is one of the most visited islands of the area. Don’t miss the hilltop monastery of St John and the Grotto of St John! Enjoy dinner and board before sailing to Crete. 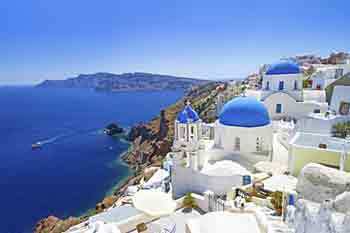 Next day on this Turkey and Greece tour – Crete and Santorini !! On arrival to Crete, in the early morning, explore historical highlights of Greece’s largest island that is a mix of brilliant shopping, stunning beaches and archaeological treasure. 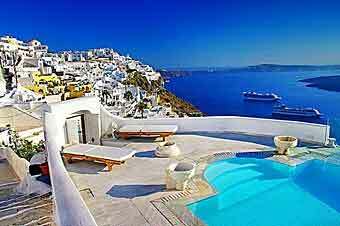 Second part of the day is reserved for probably the most famous Greek island – Santorini. Its breathtaking beauty and views on a semi-submerged volcanic crater is really an unforgettable experience. The Acropolis is in sight – welcome to Athens, Greek capital city and a place full of historical stories. Explore city’s highlights including the magnificent Parthenon and after lunchtime – cruise to Mykonos. Famous for its nightlife, rich offer of bars and designer shops, spend the rest of the day enjoying yourself in the Mykonos town and admire the beauty and sunset from a waterfront bar. After dinner, cruise overnight to Kusadasi. Arrive in Kusadasi in the morning, relax, take breakfast and then board and travel to nearby Ephesus – well preserved Greco-Roman ruins of once exciting city. Continue to Pamukkale, a UNESCO listed site that translated from Turkish means Cotton Castle. Admire the sights and work your way up to the ruined ancient city of Hierapolis. This evening, check in at your hotel. 800 year old city of Konya and Cappadocia region – day 6 is reserved for tracing a fascinating stretch of what was the fabled Silk Road. And at the end of the day, catch your short flight to Istanbul! its Grand Bazaar, 17th century Egyptian spice market and maybe a few things you’ve missed checking on day 1. Take a traditional Turkish coffee and spend last hours of this tour relaxing. After lunch, finish your tour with a drop off at the place you’ve started the tour.